Breakfast time is meant to be one of the most relaxing times of the day when the family gets together and enjoys a nutritious meal before heading off to work or school. However, the mere task of finding a breakfast meal that suits everyone in one house can be difficult and cause enough stress to ruin your day right from the start. Maybe some members of your family like toast, others cereal and some bacon and eggs. When you’re in a rush for work it is hard enough trying to get everyone dressed and out the door, you don’t exactly want to be operating six different appliances just to make everyone happy. What if there was a product that could offer a few different ways of cooking in one appliance so that everyone could be satisfied at breakfast and with minimal mess and effort? The Black and Decker 3-in-1 Wa﻿﻿f﻿﻿﻿﻿﻿﻿﻿﻿fle ﻿﻿﻿Maker could be just the appliance you’re looking for! This waffle maker gives you a way to make easy and nutritious breakfast for the entire family! As one of the most trusted names in household appliances, Black and Decker is accustomed to making quality items that help our homes run smoothly. Their huge range of kitchen appliances give a convenient and fast approach to cooking and food preparation lending us more time to spend with loved ones at the start of the day. The Black and Decker 3-in-1 Waffle Maker might sound like a simple product but it offers so much convenience and versatility that it will soon become your go to appliance for all your breakfast needs. Featuring a waffle maker, grill, and griddle, you can whip up breakfast each morning with one machine and for your entire family! If you usually spend hours in the kitchen trying to please everyone or want a convenient way to serve up a hot and hearty breakfast every morning without relying on a range of different appliances, this 3-in-1 Waffle Maker from Black and Decker is the product for you! You really can’t beat the convenience of this product. With so many options for cooking up a hot breakfast in the one item. Whether you want waffles, bacon, eggs, or toasted sandwiches, you can do it all on the one product (make pancakes and waffles using one mix- just read our blog about making waffles from pancake mix to learn how!). This is particularly great for people camping or staying away from home as well, provided you have a power outlet to plug it into. If you like your waffles cooked to perfection, you might need to look elsewhere for a product that is more focused on waffles. While you can get a great result from this appliance, some users have found that the waffles either stick to the pan or don’t come out with the golden crispy outside that is common in traditional waffle makers. However, when you consider the price of this product alone, it could cost hundreds of dollars just to purchase each of these appliances separately. To have one product that can please the entire family and whip up breakfast in under 10 minutes is truly a great convenience and this machines number one benefit. If you’re ready to make the investment for your kitchen and think the Black ﻿﻿and Decker 3-in-1 Waffle Maker is the right choice for you, you’ll find the best deal at Amazon. Right now, you can purchase this kitchen appliance with free shipping for just over $50. Considering that’s the usual cost of a just a waffle maker alone, you can’t go past the value for money. This device also has quite a good warranty when compared to other waffle makers with 2 years limited warranty coming standard with purchase. However, if you want a little more peace of mind you can get an additional four-year Protection Plan from Amazon for under $10. This includes parts and shipping in case your waffle maker needs repair which is an exceptional value for the money. To add even more variety to your kitchen, why not purchase one of the many innovative waffle recipes books from Amazon too. Many books show you how to create a meal for every occasion, not just breakfast, using the one simple device. You’ll never look at waffles the same way again! Breakfast time doesn’t need to be a mad rush in your house anymore with the Black and Decker 3-in-1 Waffle Maker. When you can cook eggs, grilled sandwiches, pancakes, waffles, bacon, tomatoes, and more all on the one device and with minimal mess, you’ll never go back to a traditional kitchen setup again. For those who want a little more from their waffle maker and the option to cook a variety of foods, this is the perfect all in one product. If you’re tired of fumbling around with a million different kitchen appliances and want to get back some time in your mornings, click here to purchase the Black and Decker 3-in-1 Waffle Maker. If you are looking for something a little more simple, check out our Ultimate Buying Guide for more reviews and comparisons! I am an entrepreneur, blog writer, and lover of home gadgets. 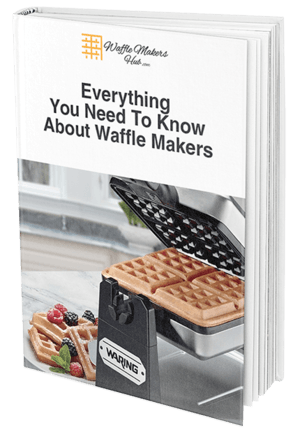 I love making different types of waffles and trying out the latest and greatest waffle machines.